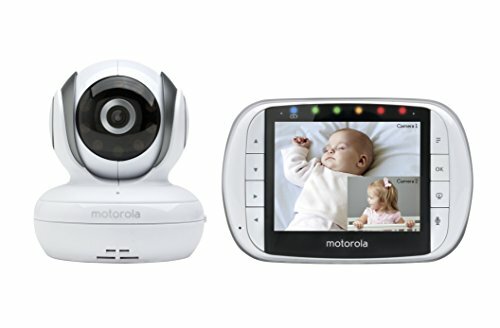 The Motorola MBP36S Baby Monitor offers the ability for parents to be able to both see and hear their children without being in the room with them. It does this by utilizing wireless technology to transmit the video and audio from a camera placed in the child’s room to a 3.5-inch color full-colour screen. The product also utilises a microphone in the screen and a speaker in the camera to enable parents to be able to talk to their child, allowing them to tell them to stop doing something without having to enter the room, this is particularly useful in the day time when a child might be playing in their room whilst the parent is in another room doing something else. One of the most notable features of the product is the camera, which is equipped with many features that make it stand out. One of these features is the fact that it can operate in both bright and low light settings. This is useful as it means that parents can use the same unit to keep an eye on their child both day and night. This, coupled with the camera’s ability to change its position. Controls on the parent’s module allow control of the pan, tilt, and zoom of the camera. This means that parents with more mobile young ones will be able to reliably keep an eye on them and have peace of mind that they are safe, without constantly having to be in the room with them. 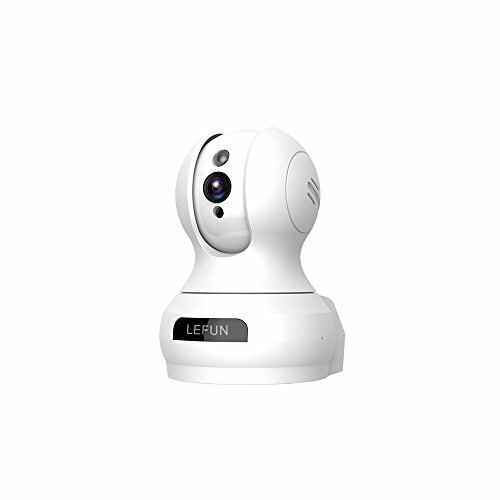 The product also allows for the additional connection of up to three more cameras, which can be viewed simultaneously using the split screen function, making it far easier to keep track of the whole family. Another useful feature of this product is the integrated two-way communication. 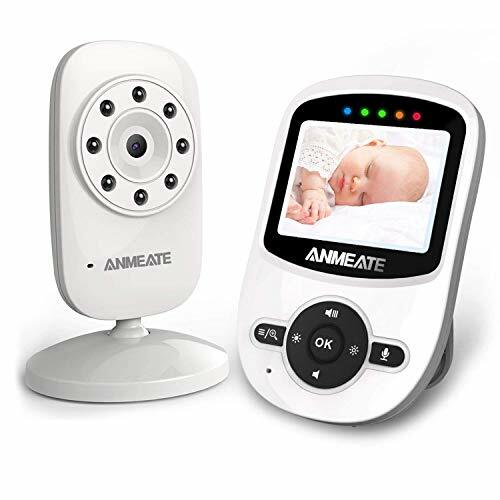 This utilizes microphones and speakers in both the cameras and screen to enable parents to respond to their little ones. With a baby, this could just include talking to it to calm it to sleep, but with a slightly older toddler, this feature can be used to tell it to lie down or stop something before they hurt themselves. As well as this, the screen module also includes a sound indicator in the form of 5 LEDs. this is useful because it means that, if the parents are watching a film, they can safely mute the screen and still know if the child is crying.The wireless broadcasting that the product uses has a range of 590 feet. This means that the parents should be able to keep in touch with their child from wherever they are in the house. This means that the parents will be able to get more done whilst the child is in their room, safe in the knowledge that if anything happens, they will know about it immediately. The camera comes equipped with both day and night vision modes, meaning that parents can keep an eye on their child no matter what the lighting situation is. 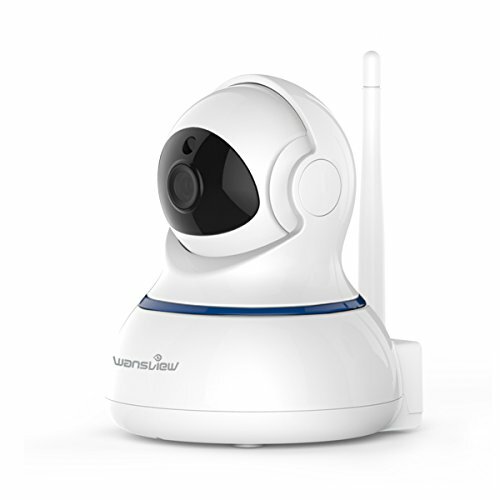 Remote controlled pan, tilt, and zoom mean that the camera can watch the child from wherever they are in the room. Wireless range of 590 feet means that the parents can be in touch with the child from any room in the house. Two-way communication allows for the parents to talk to their child without having to be in the room with them. The high sensitivity of the microphone ensures that the parents hear anything that happens in the child’s room. LED noise indicator allows for parents to mute the volume on the screen but still know if their child is crying or not. Charges from a micro USB cable, so if a spare charger is needed, an android charger will do just fine. Split screen function allows for viewing of more than one camera at the same time. Short battery life at only 3.5 hours means that the product cannot be used to keep an eye on a child overnight without being charged. Only provided with one camera, meaning that any others must be purchased separately, which drives the cost of the product up. The product is relatively high in price for both the initial system and any additional cameras after that. The audio pauses when the camera moves, meaning that there is the potential to missounds whiles monitoring the child. This Motorola MBP36S has received mixed reviews from customers. There is almost an even split between people who have given it five-star ratings and people who have given it one-star ratings.Those customers who give the product positive ratings have found very little to be wrong with it. One user praises the sound quality of the device saying that it was so much clearer than it’s predecessor (The Motorola MBP36), and also states that is built more robustly than other products on the market.The customers who have given the product negative reviews find fault with the internal workings of the product, with some stating that they have found the soldering to be shoddy and that the charger is prone to stopping working. In conclusion, this product seems to excel at its job and does perfectly well at allowing parents to monitor their children without having to be in the same room as them. The fact that it allows for night time and daytime monitoring, as well as offering the ability to remotely control the camera means that it is a perfect choice for parents with toddlers who have suddenly found their feet. Despite this, however, the product is not without fault, as its short battery life means that it is not capable of watching a child for an entire night, and the fact that it’s fairly expensive means that first time parents may have difficulty being able to afford the product on top of everything else they need for their child. Overall, the Motorola MBP36S seems as though it’s very well built for the purpose, and if parents are willing to deal with a couple of setbacks with the product, it would be a good buy.